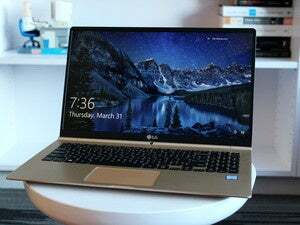 Shortly after bringing its Gram line of laptops to the U.S., LG unveiled a new addition to its ultralight computer lineup with a 15.6-inch display at CES this year. The Gram 15's killer feature is its weight. It comes in at 2.16 pounds -- just under a kilogram. Holding it in your hand, it feels like you're holding a computer made of air, which happens to have a big screen. The magnesium alloy case that makes this computer so light is also its biggest flaw, at first blush: The Gram 15 feels kind of plasticky. This probably won't be a major concern for people who want a lightweight computer above all else, but it will almost certainly turn off other buyers. However, for those folks who are looking for a good Netflix machine that won't break their back when they're walking around, this seems like a good option. LG hasn't released pricing or said when the Gram 15 will be available, other than to say that it will be "coming soon to a retailer near you."